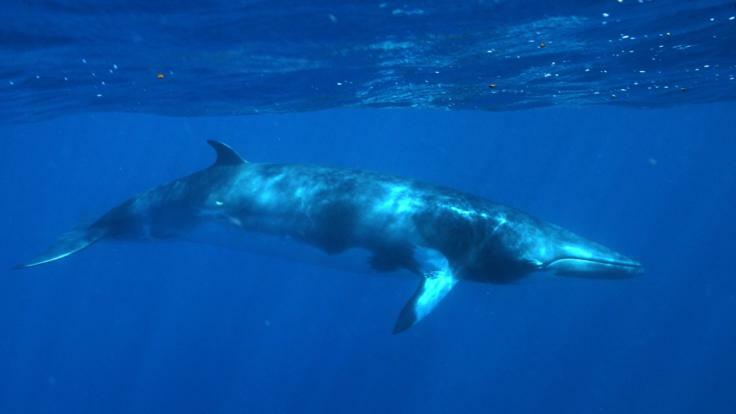 This luxury private charter yacht offers a host of extra special options that you can add on, such as swimming with Dwarf Minke Whales, scuba diving, spearfishing, kitesurfing and helicopter flights. Ask us about these options when you book. 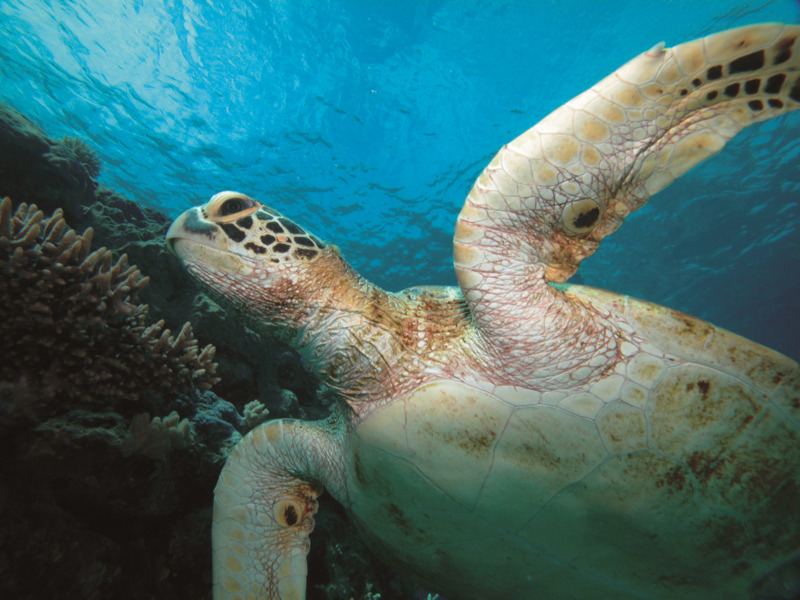 Our Cairns based private charter yacht has been plying the waters of Australia’s Great Barrier Reef with spirited families, special interest groups, scientists, film makers, movie stars, rock stars and more, showing them the most amazing locations and having the most amazing marine encounters with our highly qualified and highly professional marine naturalists and onboard specialists. 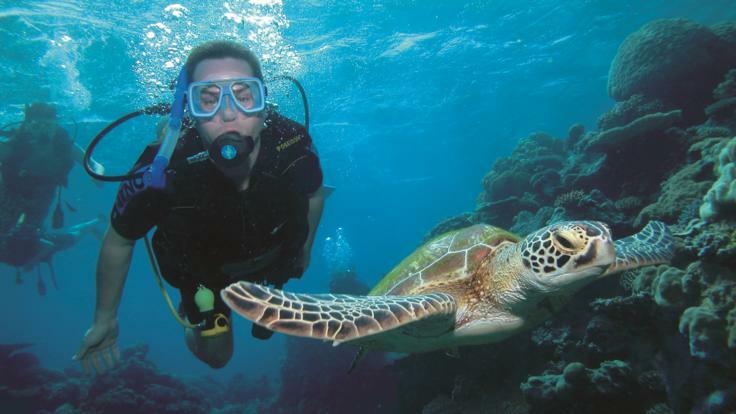 All you need to do is tell us what your specific interests are and then we will design the perfect Great Barrier Reef tour itinerary and ensure we make it happen!. 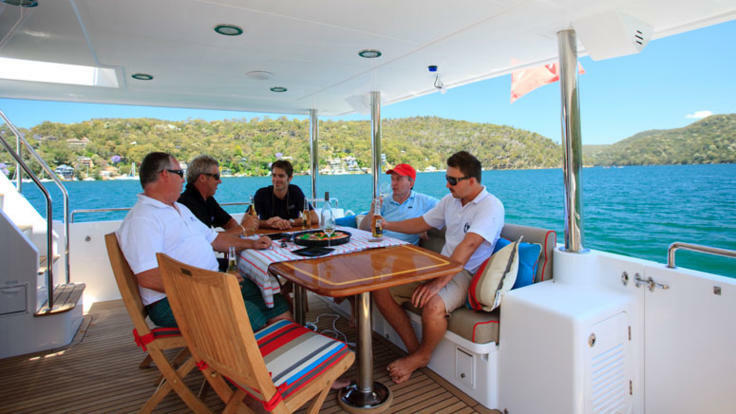 Our luxury private charter yacht is available for a one day private charter or multi extended overnight expeditions from her home base in Cairns or can be relocated to Hamilton Island, the Whitsundays, Cape York or Weipa for your next holiday. 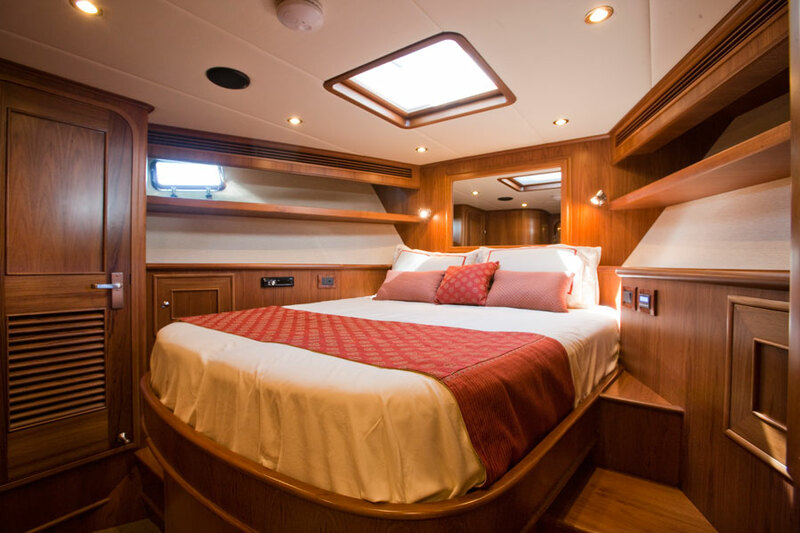 At 70-foot this luxury motor yacht sleeps up to 9 guests in three staterooms on our liveaboard charters and caters to a maximum of 12 guests on a one-day boat charter. 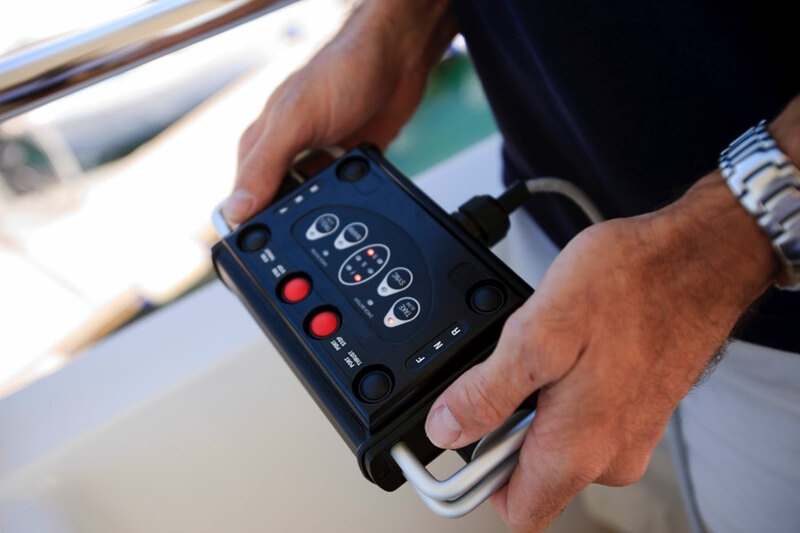 Our yacht is a good option for guests that may experience sea sickness as she has built-in stabilisers to help keep her steady whilst underway in all sorts of ocean conditions. 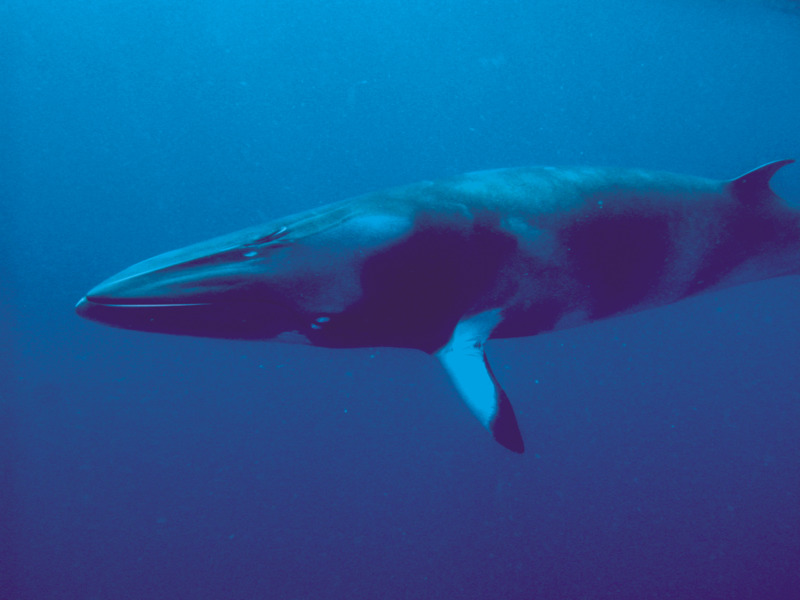 We arrange special private charters to "swim with Dwarf Minke Whale tours " during the months of June and July, Coral Spawning dives in the months of October and November, Mother Shipping for the Big Game Fishing Fleet, October to November, and Barramundi fishing expeditions March to June. 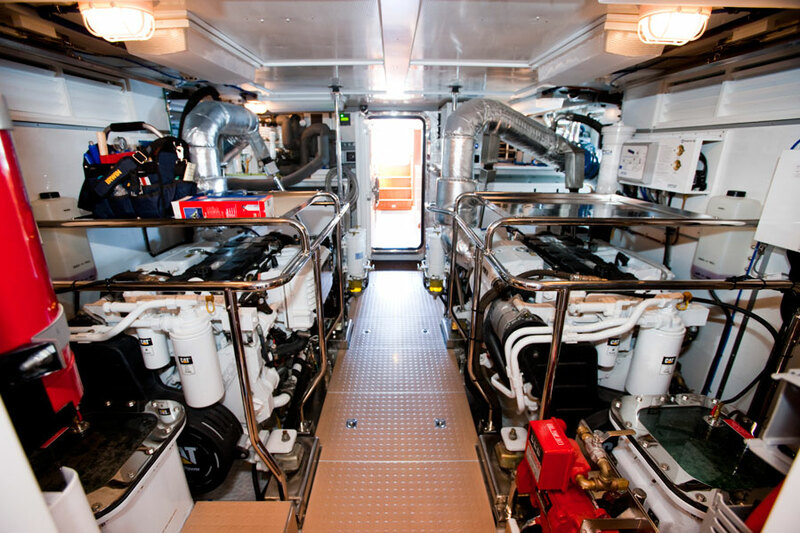 Our crew are made up of highly qualified marine biologists, scuba diving instructors, trained chefs and marine engineers. 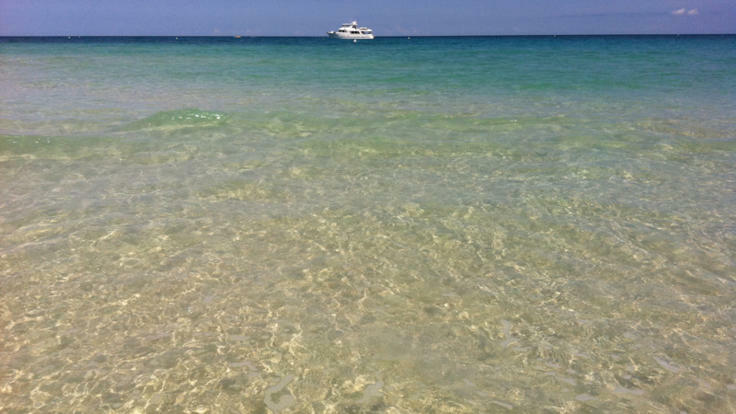 All private boat charters are catered for individually so if you have any special needs or requests please do not hesitate to ask. 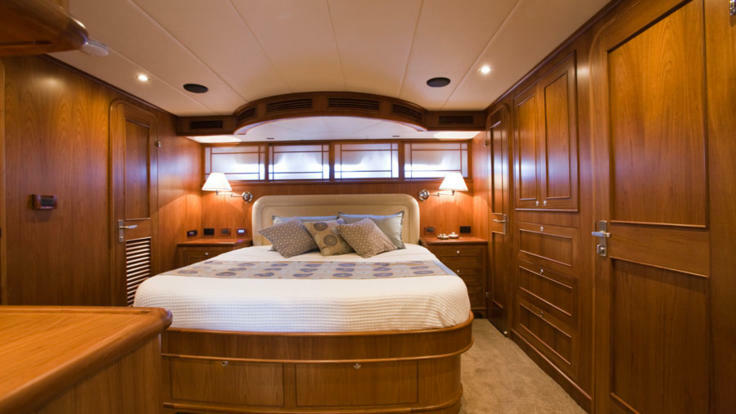 Ranging the East Coast of Australia from Sydney and over the top of Australia to Broome she was built purely for comfort, space, relaxation and long range cruising. 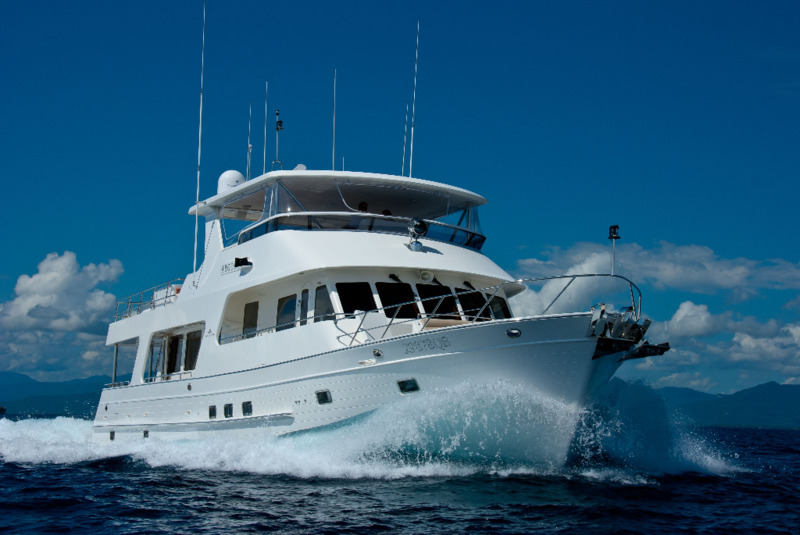 This luxury private charter yacht is one of the most popular private charter boats available in Cairns, Port Douglas, Whitsundays and all around Tropical Far North Queensland and the Great Barrier Reef due to her size and cruising range. 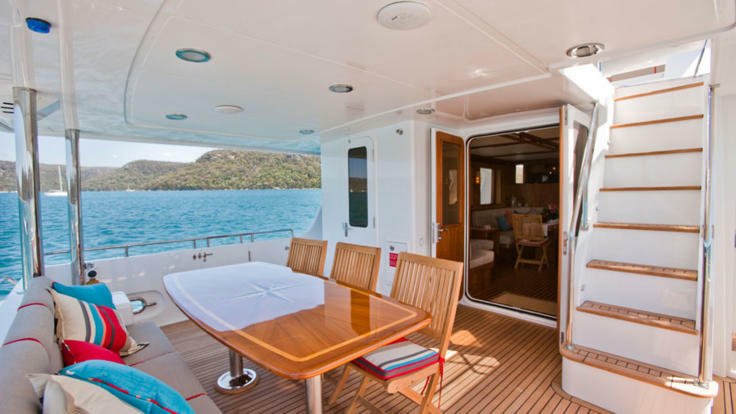 Launched in 2010, this private charter yacht is modern, chic and luxurious and is equipped with all the state of the art technology including high-speed internet and hydraulic stabilisers for an ultra-smooth ride across the waters of the Great Barrier Reef in Australia. 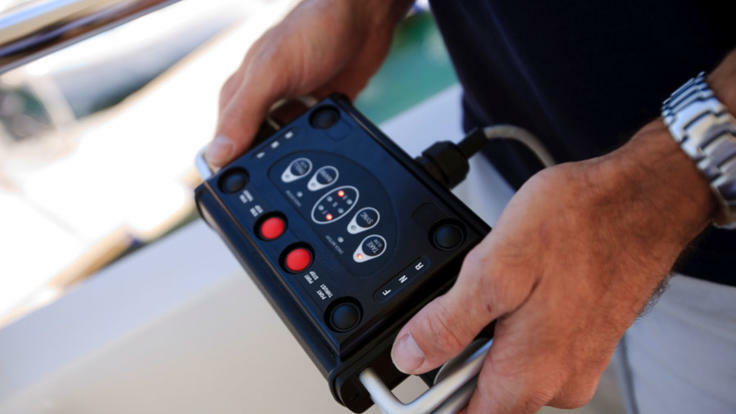 The boat's stabilisers are paddle-like arms that counteract the natural roll from the swell underneath the boat allowing for minimal movement while the boat is steaming which is perfect for those guests that may experience a little seasickness. 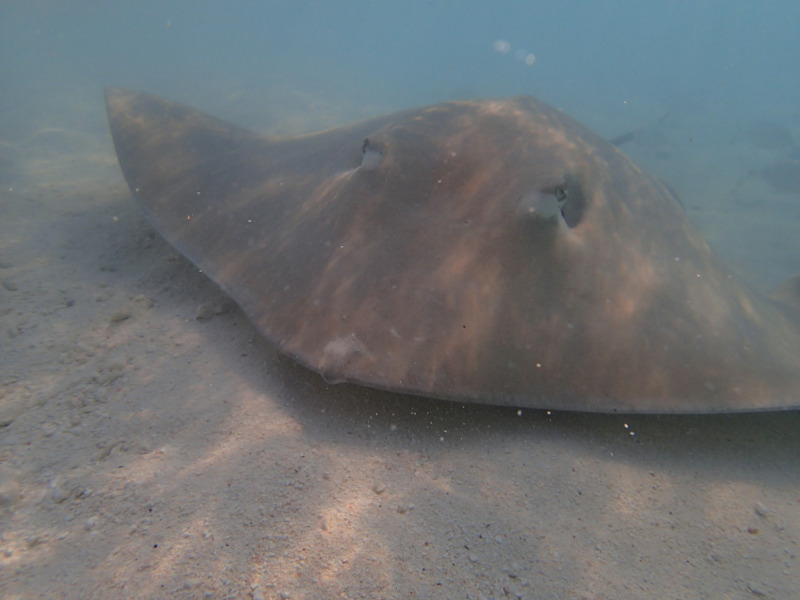 The stabilisers also ensure a good night’s rest for when the boat is moving to another new diving location for its guests to wake up to the next day. 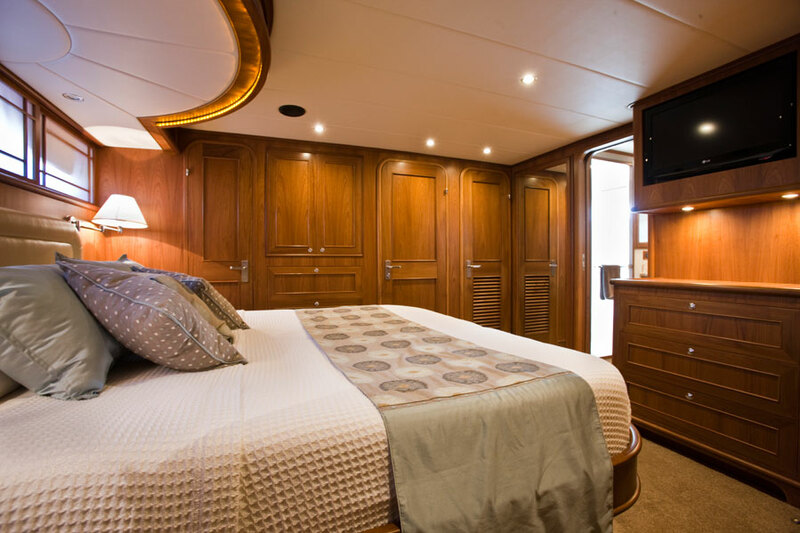 3x luxury staterooms all fitted with LCD flat screen televisions complete with Foxtel channels and DVD Players. All guest rooms have their own private en-suites. She can comfortably sleep up to 7 guests. 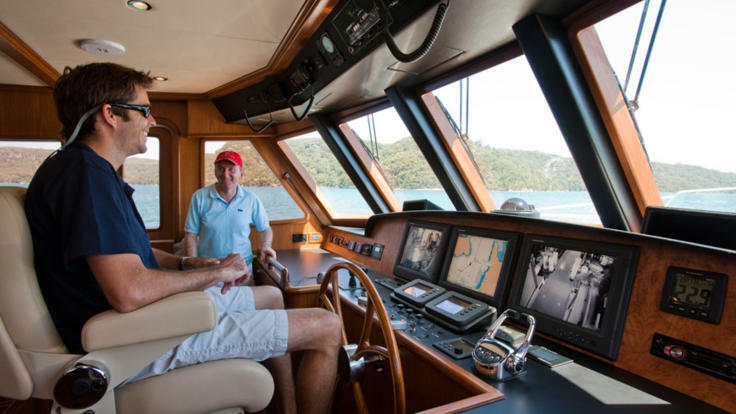 Thru the year when not out on charter our luxury private charter yachts home port is Half Moon Bay Marina, at Yorkey’s Knob, a 10-minute drive north from the Cairns central business district. 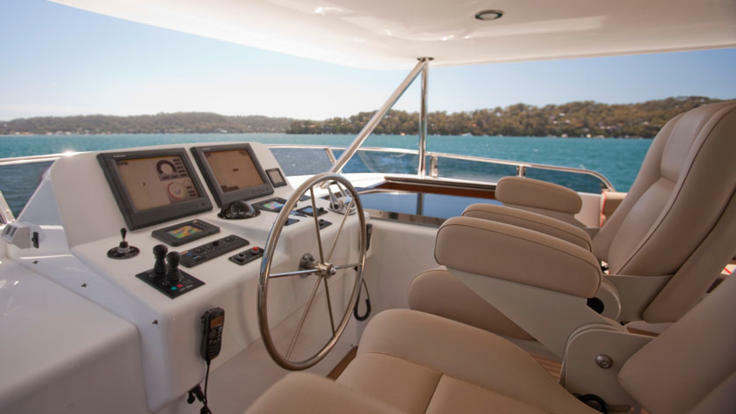 Our motor cruiser can be booked to venture almost anywhere from Port Douglas, Cairns, Lizard Island, The Coral Sea, The Cape York Peninsular, the Whitsundays and anywhere in between for various charter costs. 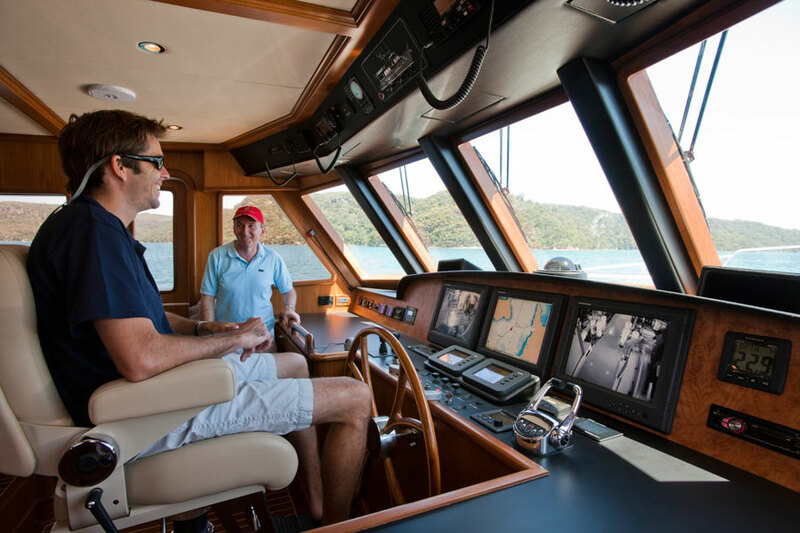 Out team of private charter boat specialists love planning bespoke private charter Itineraries as they can tailor them to suit your desired adventures and the time frame you have available to enjoy the offerings of Australia's Great Barrier Reef. 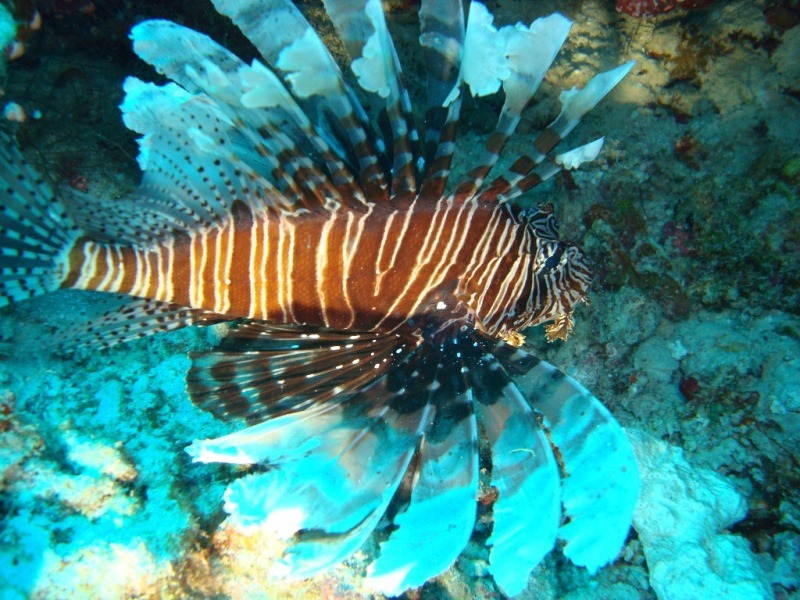 If you have the desire to go deep sea fishing in some of the most remote locations for the prized redfish or sports fish, a scuba diving and snorkelling underwater adventure with giant Cod or Dwarf Minke Whales or you wish to just relax and laze about on a palm-fringed island or secluded sand cay along the edges of the outer Barrier Reef we know just the places that are perfect. 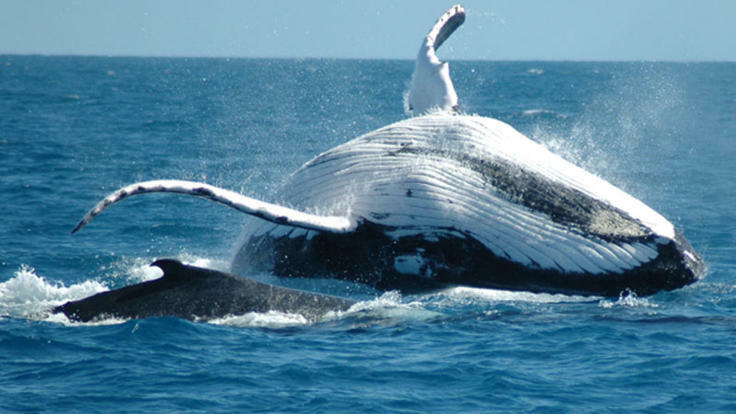 Should you wish to do a bit of heli fishing in remote outback places or you wish to meet the boat out on the Great Barrier Reef we can arrange it all. 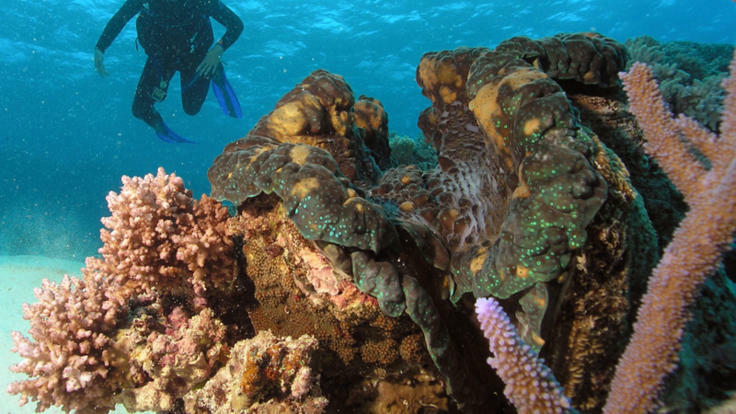 The Great Barrier Reef in Australia has it all for the adventurers. Please note there may be re-location charges for the yacht to be in a specific location at a specific time. 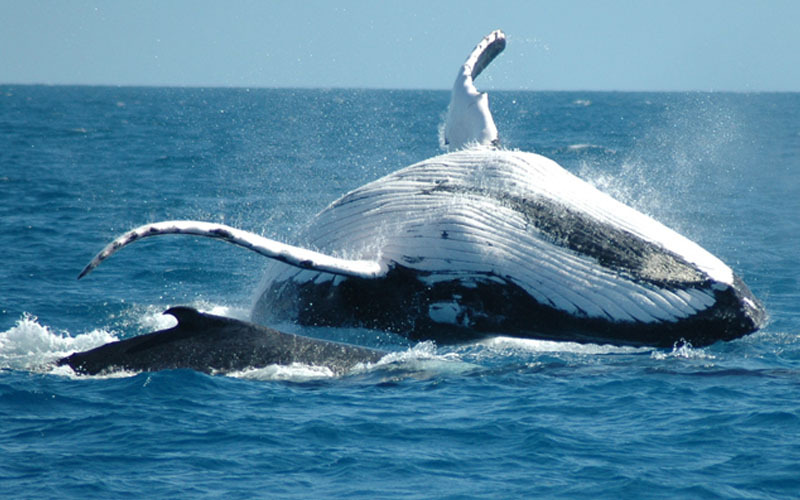 Once all of the guests are aboard and settled in we depart the boat marina at Yorkey’s Knob at 8.00am for a relaxing 1.5 hr cruise to the edge of the Great Barrier Reef. 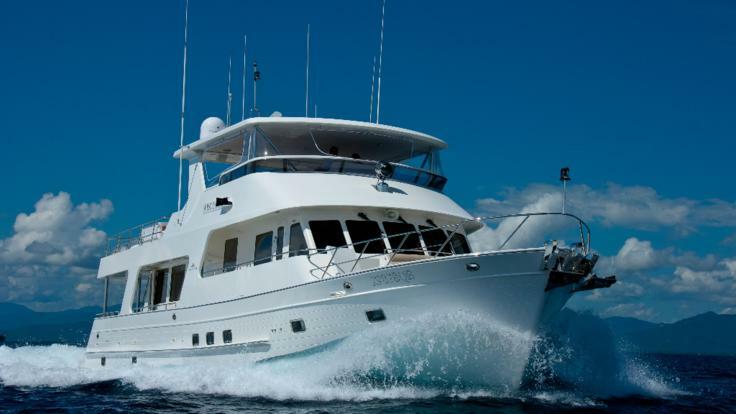 If you are keen on fishing you can have a line set to try your luck at some trawling for game fish as the motor yacht cruises to Vlassoff Cay or, just sit back and enjoy the colours of the reef with morning tea and a tropical fruit tasting. 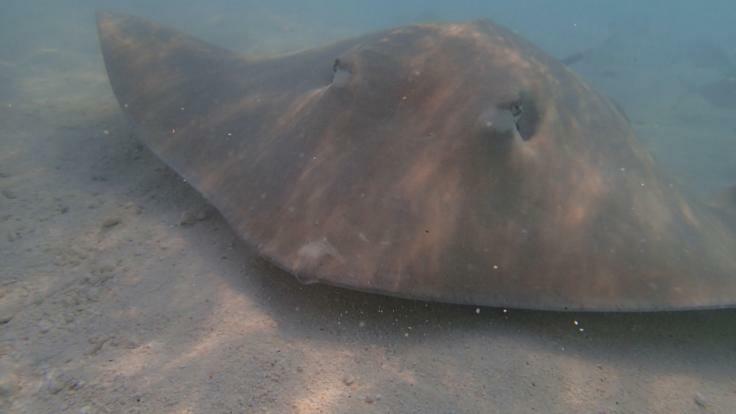 We arrive at approximately 10.00am at a secluded Outer Barrier Reef location for some snorkelling and scuba diving or if you prefer some fishing. 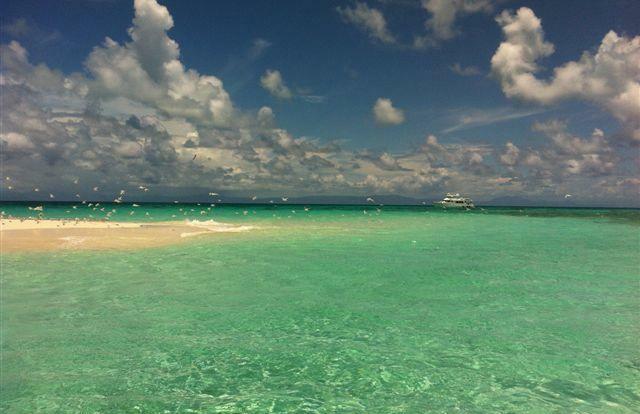 Around the middle of the day you will be served a gourmet luncheon then you can choose between another scuba dive, snorkel, or a walk around the breath-taking Vlasoff Sand Cay and a swim in the shallow crystal blue waters. 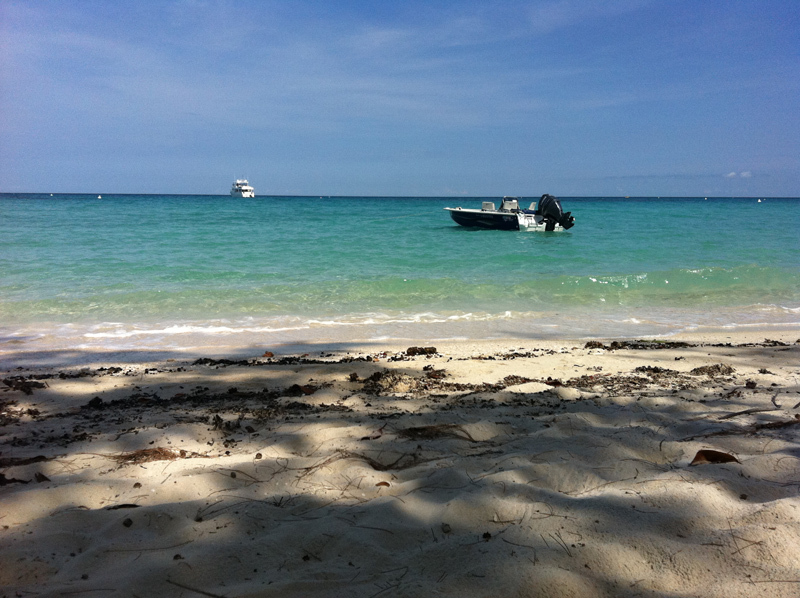 People arrive on this sand cay and never want to leave as the colours are mesmerising and the warm waters and marine life that surround are everything that holidaymakers dream of when they are sitting in their corporate office towers in the middle of a cold dark winter’s day. 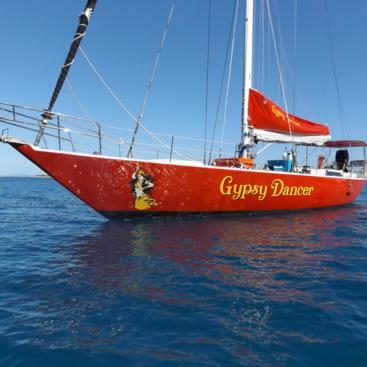 Just relax on the cruise back to Cairns with a few cold drinks and canapés before arriving at Yorkeys Knob Marina at approximately 5.30pm. Includes light breakfast, lunch and canapés provided by a qualified private chef. 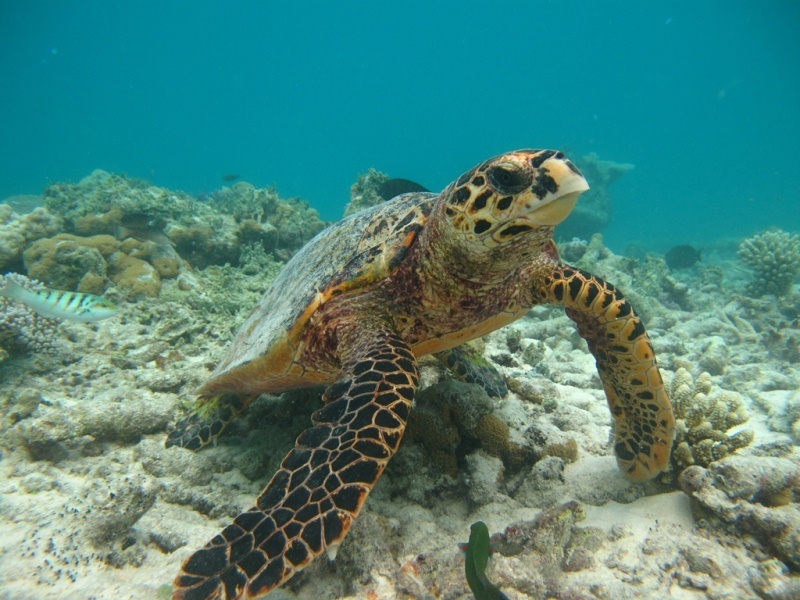 If you are really wanting to experience the Great Barrier Reef fully you need to indulge and spend more time soaking up the mesmerizing beauty of the Great Barrier Reef by booking a private overnight charter for your family or friends in the luxury guest cabins on the motor cruiser. You could be enjoying evening drinks and canapés on the top deck as the sun goes down whilst the gourmet chef creates an unforgettable meal for you to enjoy the last rays of the day over the coral sea. Wake up to a delicious breakfast to enjoy while cruising back to the marina and arriving at approximately 10.00am. Includes 2 breakfasts, lunch, canapés, dinner and dessert provided by a qualified chef. 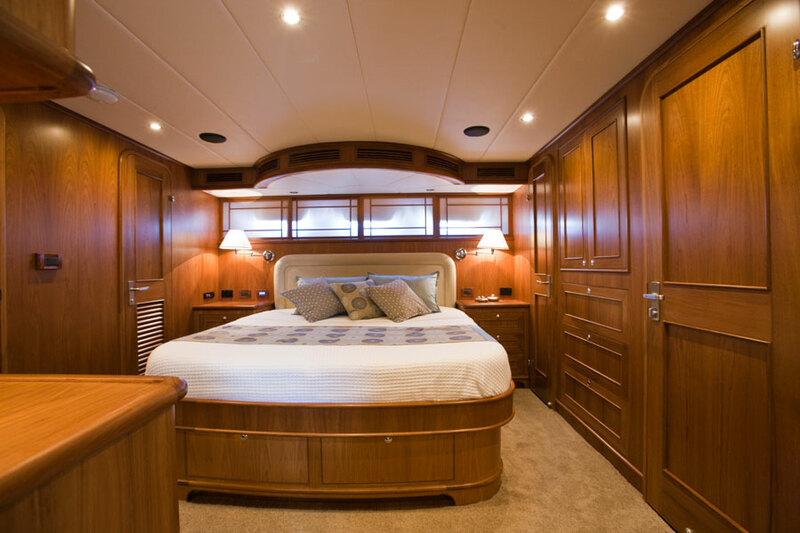 On arrival at the Yorkey's Knob Boat Marina at 8.00am you are greeted with a light breakfast on board and an introduction to the crew before departing for one of the spectacular Outer Barrier destinations on your two-day charter. 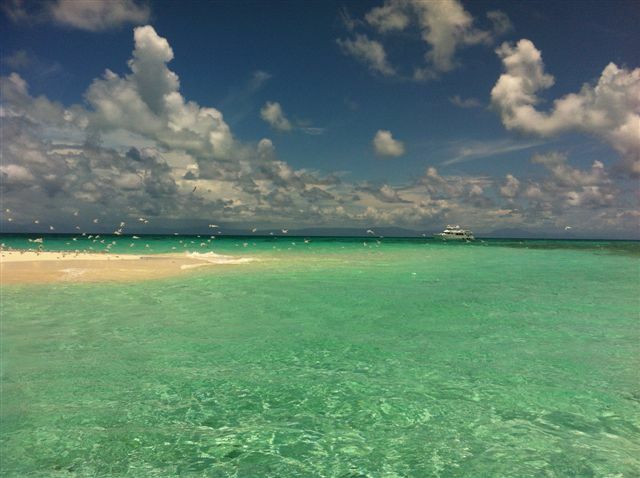 On the cruise out, soak up the sun and views of the tropical, palm-fringed coastline or troll for a Spanish mackerel or tuna that the chef can prepare for your gourmet lunch. 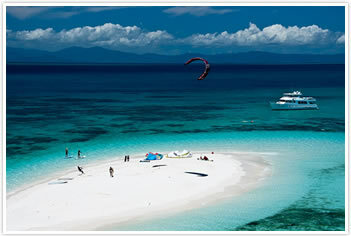 The Great Barrier Reef is yours to enjoy as are all the water sports equipment on board the boat. 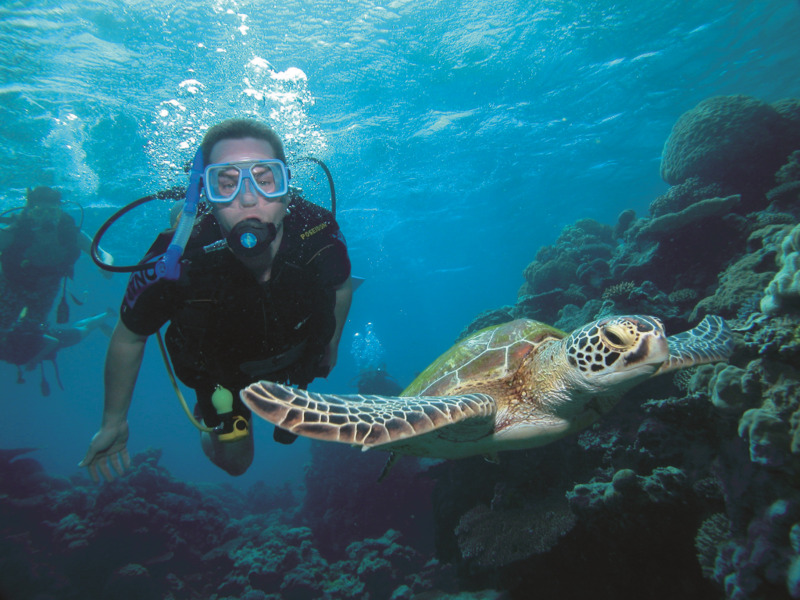 From light tackle sports fishing to snorkelling or scuba diving at the best reefs in the Cairns region, the skipper will ensure your day is filled with experiences and adventures you will never forget. 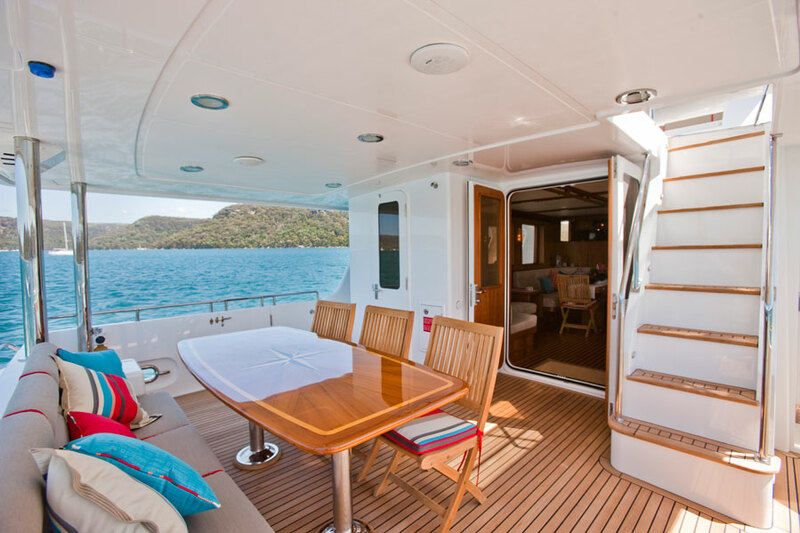 Between all the activities offered on this private charter yacht, you will enjoy gourmet meals freshly prepared by the chef for lunch, afternoon canapés and dinner as the sun sets. 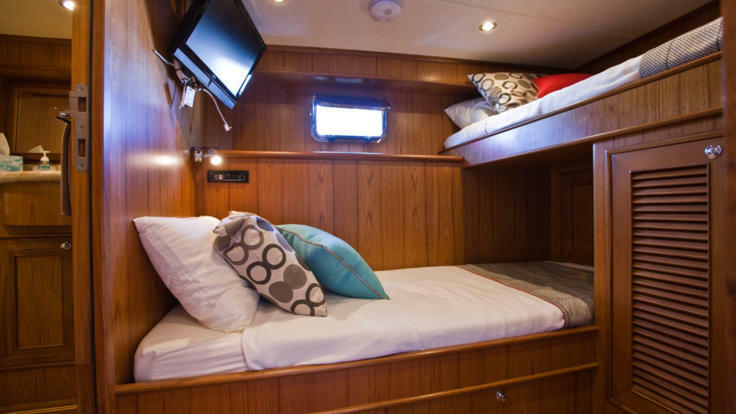 Spend a few hours beneath the stars on the top deck before settling into your luxury private cabin to get a good night's sleep before another full day of aquatic adventures. 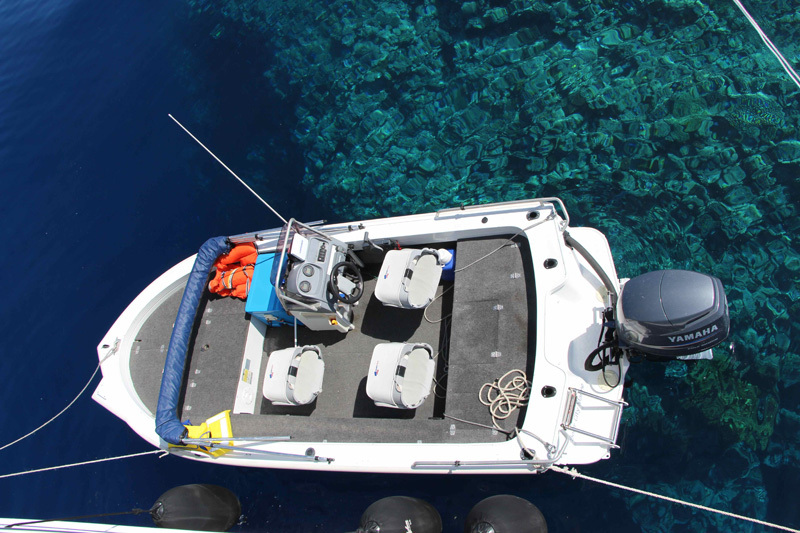 Whilst you are enjoying your sleep, the boat will be moved to a new location where you will wake up refreshed and ready to start the day with a whole new coral reef to enjoy. 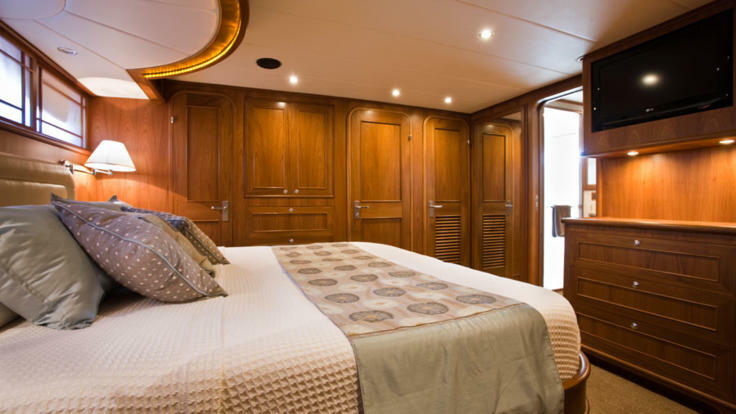 If you are up early enough you can begin the day witnessing a breathtaking sunrise over the coral reef and an alfresco breakfast on the aft deck. Being out on the ocean really gives you an appetite so the chef always ensures he has a wide selection of breakfast offerings for all onboard guests. 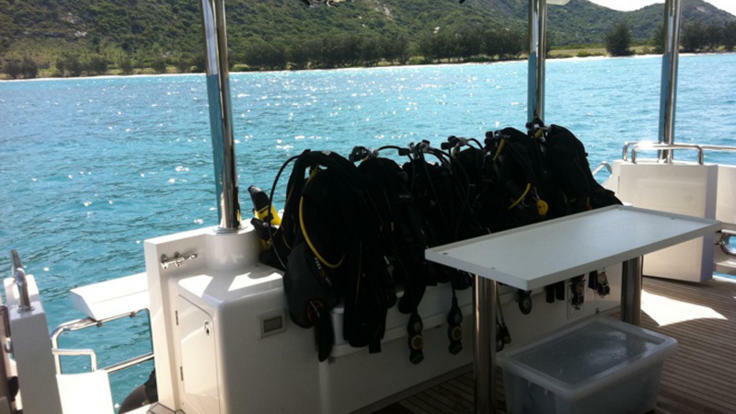 Spend the remainder of the day enjoying the underwater views scuba diving or snorkelling with the highly experienced and qualified dive masters on board. 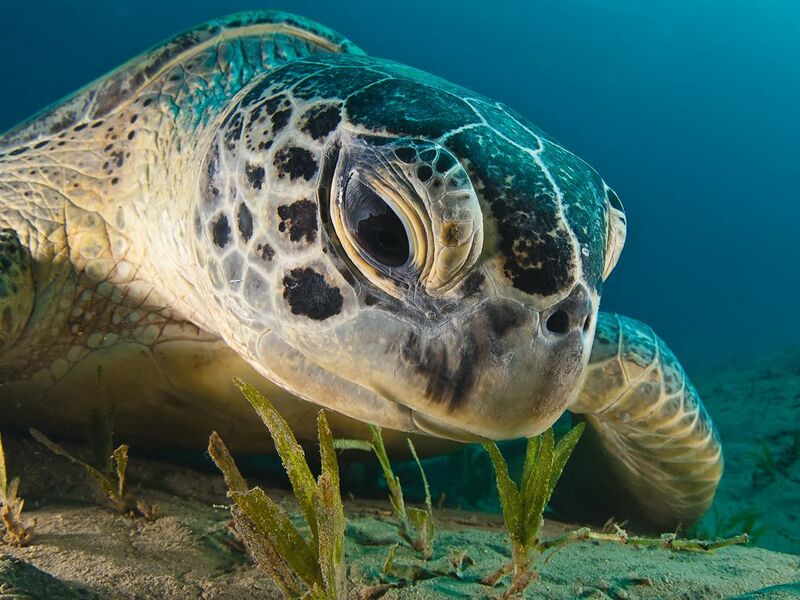 If you’re the adventurous type you could take the ultimate scuba diving experience and partake in a night dive to see the reef come alive after dark and navigate the coral reefs to find the fish and marine life that normally hide during daylight hours. 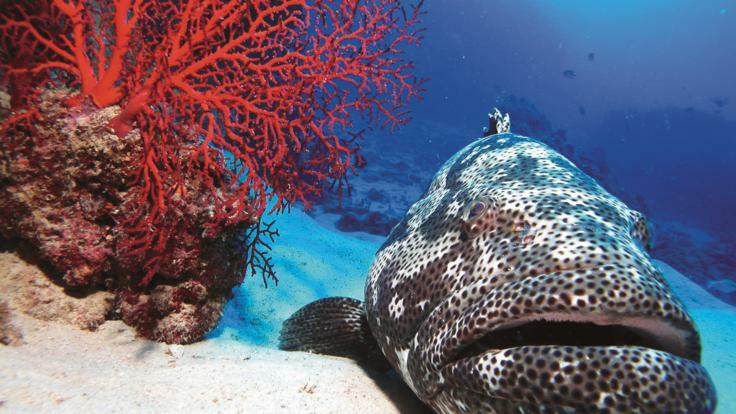 For those guests staying topside try your luck at catching the highly prized coral trout on a hand line or chase delicious red emperors with your lines set after sunset. 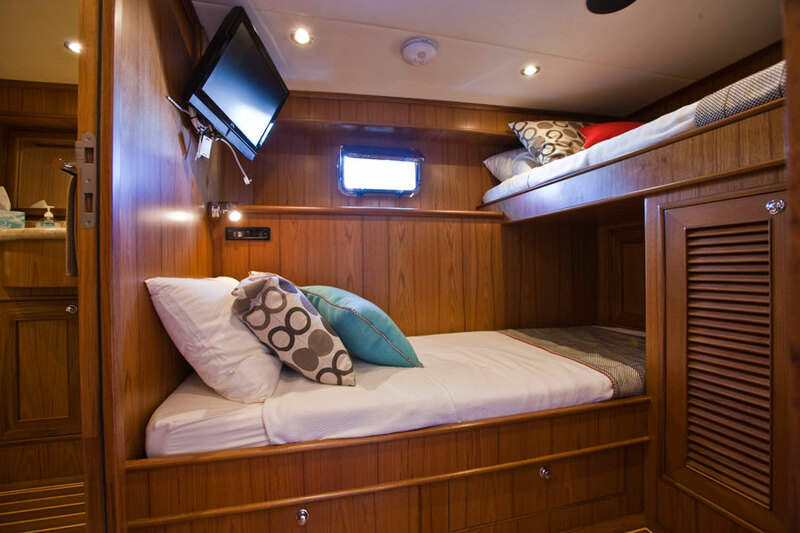 After another fun-filled day on the reef, get a good night’s rest while the skipper cruises back towards the marina. Wake up to a light breakfast on board before departing back to your Cairns accommodation or your flight from the Cairns airport. Includes 2 breakfasts, lunch, canapés, dinner provided by a qualified chef. 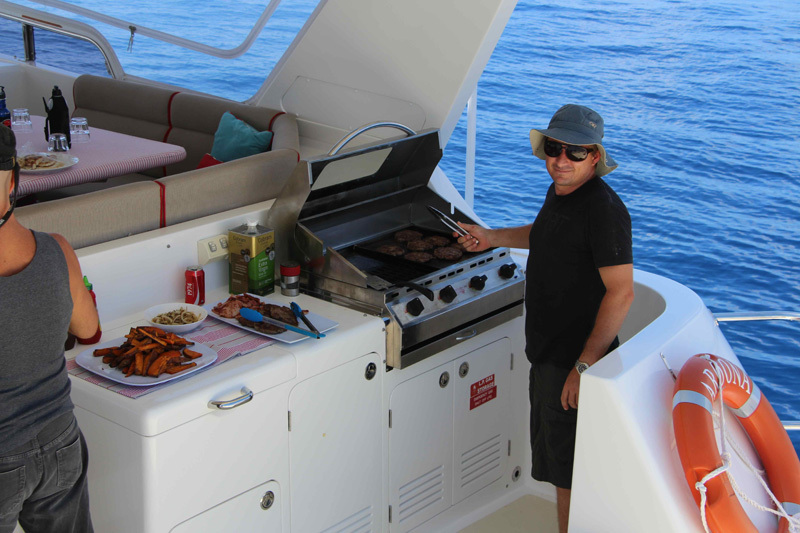 Arrive at Yorkeys Knob Marina at 6.00pm to meet the motor boat's crew and enjoy a lovely dinner prepared by the onboard chef before settling into your cabin for the overnight cruise to the remote Ribbon Reefs on the outer Great Barrier Reef. 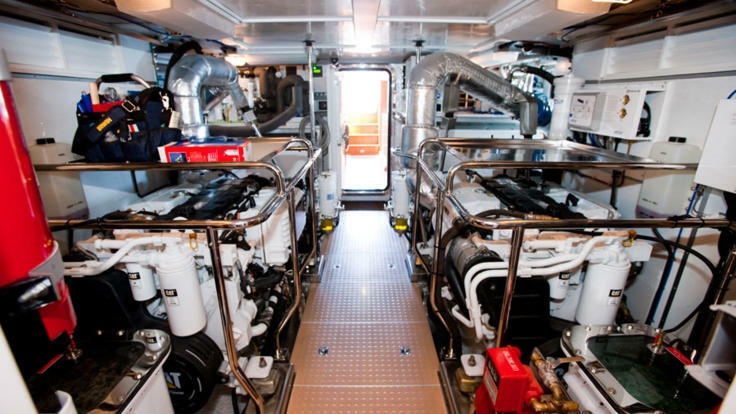 Your cruise out to the Ribbon Reefs will be smooth due to the boats on board stabilisers ensuring a good night’s rest for all. 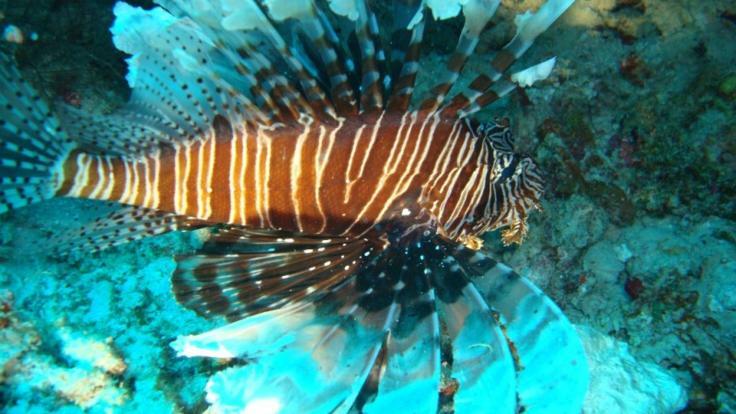 The Ribbon Reefs are world renowned for their vast coral diversity and richness of fish and other marine species. 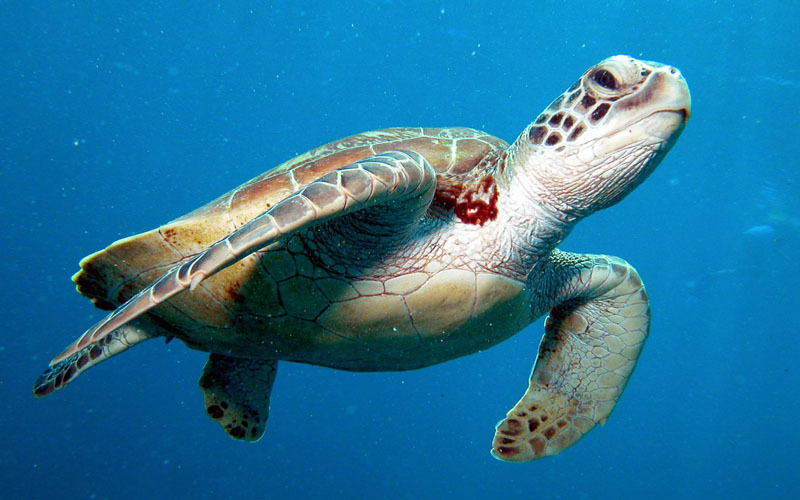 Spend the next two days exploring the reefs underwater or topside as the skipper shares his expertise on these remote snorkelling and scuba diving locations. All meals are prepared by a qualified chef so if you have any special requests please ensure you advise us early when booking the private charter. 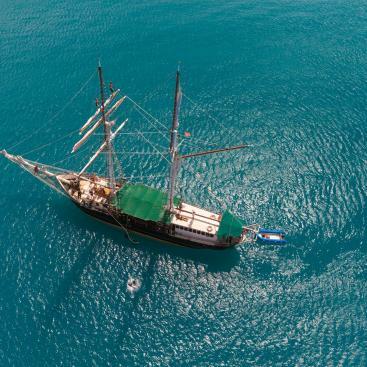 The days in water and on deck activities will be adapted to fit your needs and desires. 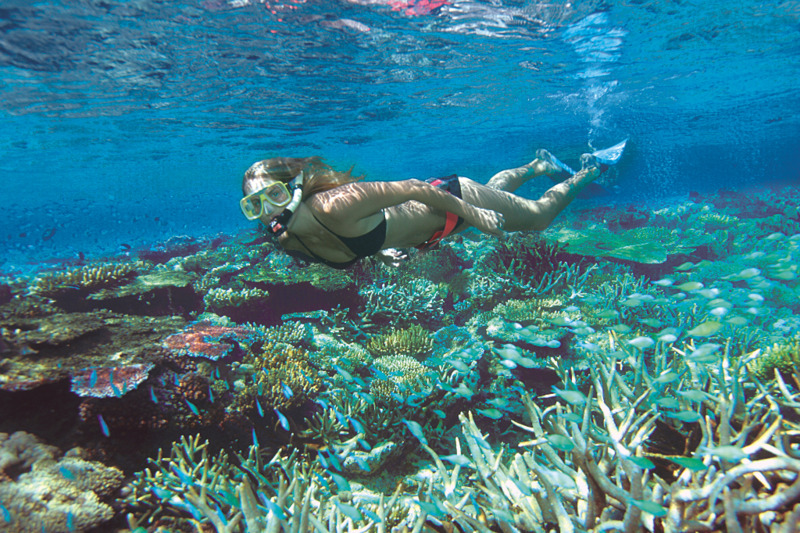 Activities can include fishing from the well-equipped tender, drift dives along the outer reef walls to see the spectacular marine life that group here and snorkelling or scuba diving in the shallows amongst the coral gardens and giant clams. 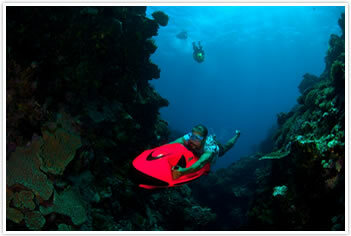 Spend your second night at another equally impressive and secluded reef anchorage. On your third night, the skipper will cruise south while you are sleeping. 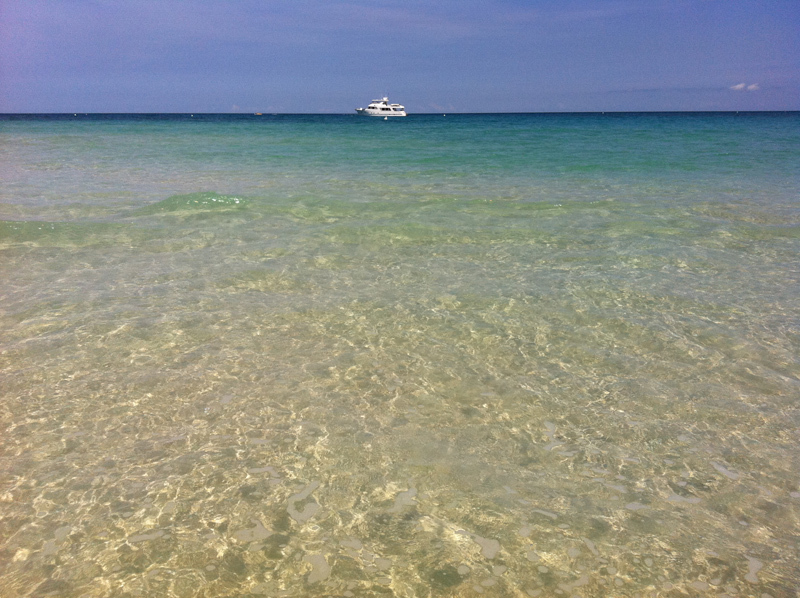 Soak up your last day strolling on a stunning solitary sand cay or sun baking on the bow of your luxury charter boat. 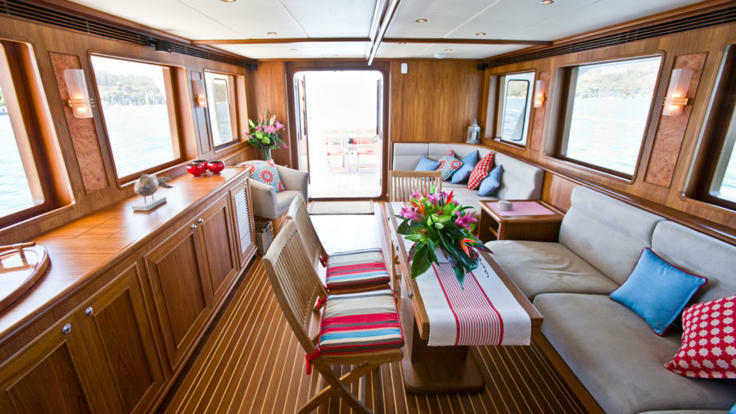 Canapés and drinks are served on the top deck while you reminisce about the last three days of adventures before arriving back at the Yorkey’s Knob Marina. 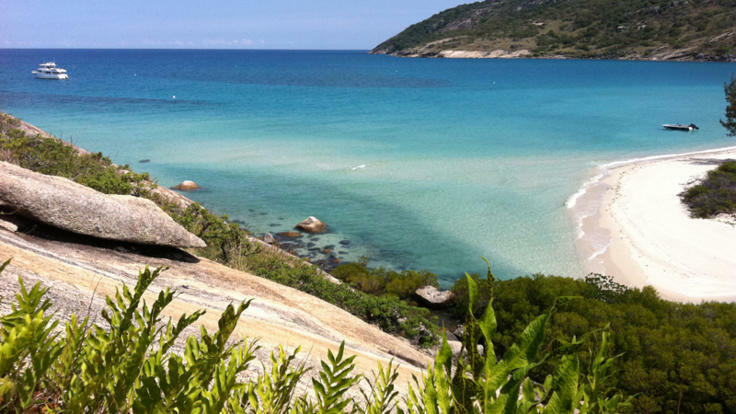 We will arrange to fly you and your group to Lizard Island in a privately chartered plane where you will board the private charter yacht and meet your ship’s crew who will soon become friends over the next six days. 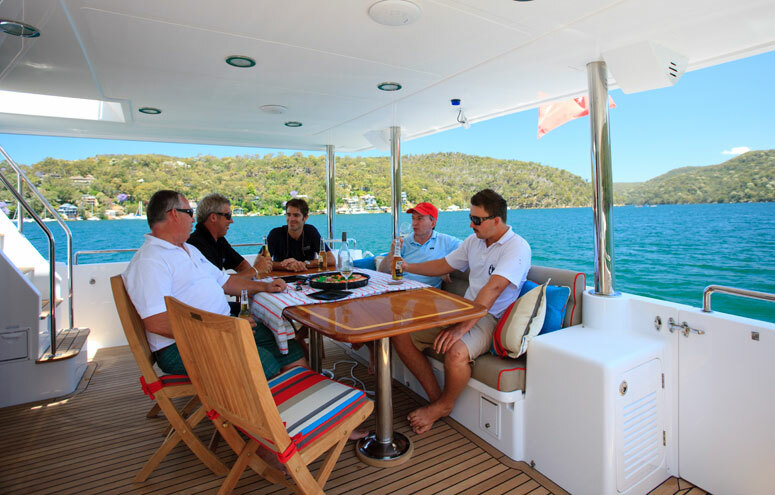 Enjoy a sumptuous luncheon created by the onboard chef before heading out to explore the majestic Lizard Island in all its beauty. 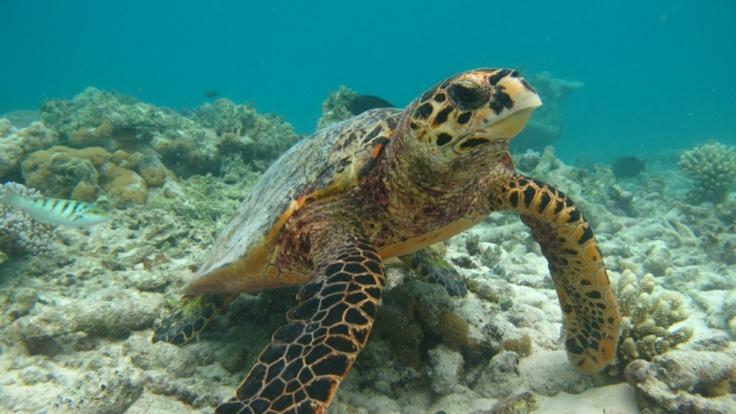 Lizard Island is well known in the world of the rich, famous and influential as a luxurious hideaway from the business world and a luxurious honeymoon destination so you will really feel very special to be given the opportunity to explore some of the island's treasures. 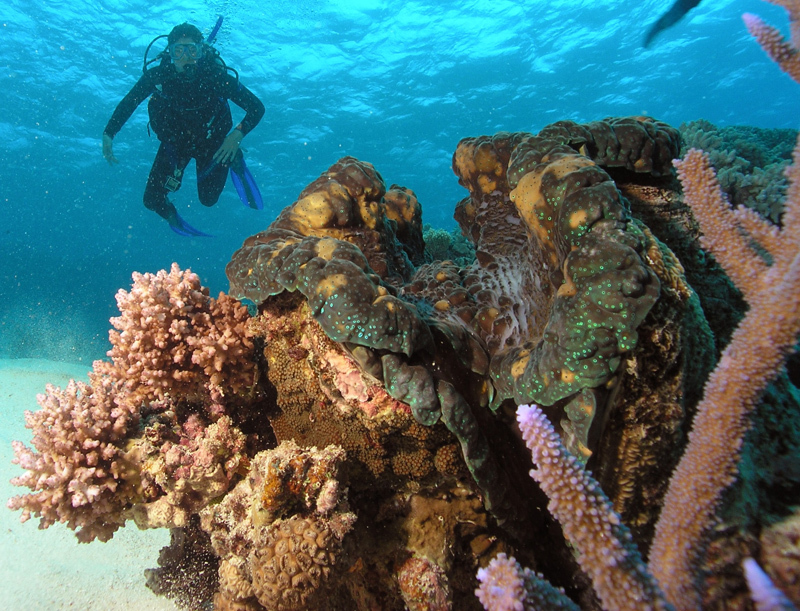 After lunch your Great Barrier Reef journey and adventure begins when you take a hike up to Cook’s Look for a spectacular view over the Ribbon Reefs. 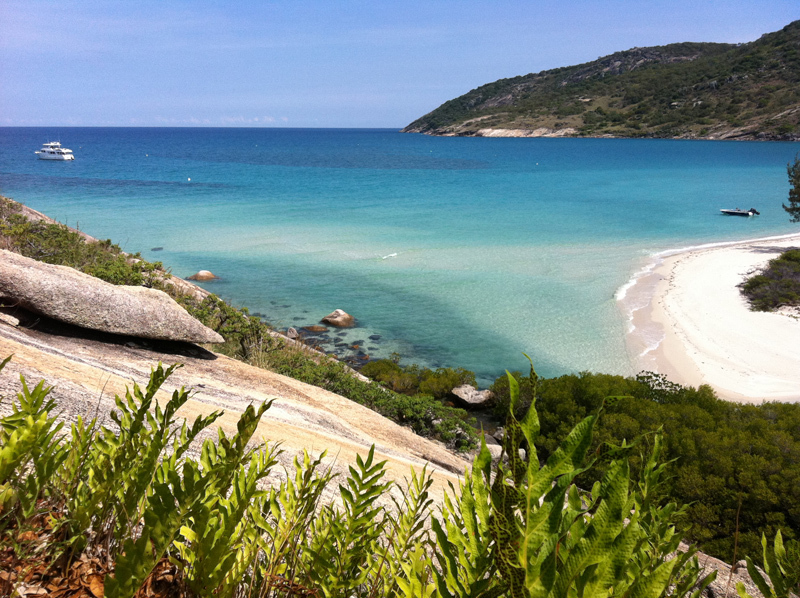 A hike over to the famous Blue Lagoon and explore the southern side of Lizard Island, relax on the beach at Watson’s Bay or settle in to your cabin and enjoy the boats luxurious amenities. 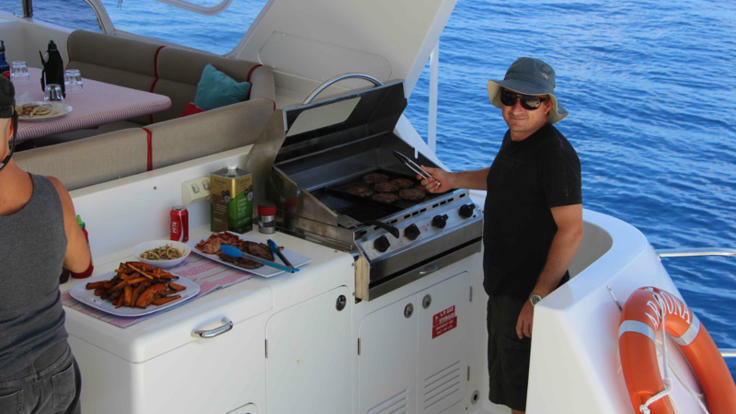 Spend your first evening on the top deck with a sunset barbeque in the sheltered anchorage of the famed Watson’s Bay as the warm winds brush over the ocean. An exciting adventure is ahead of you on day 2 as you wake up at the world famous Cod Hole. 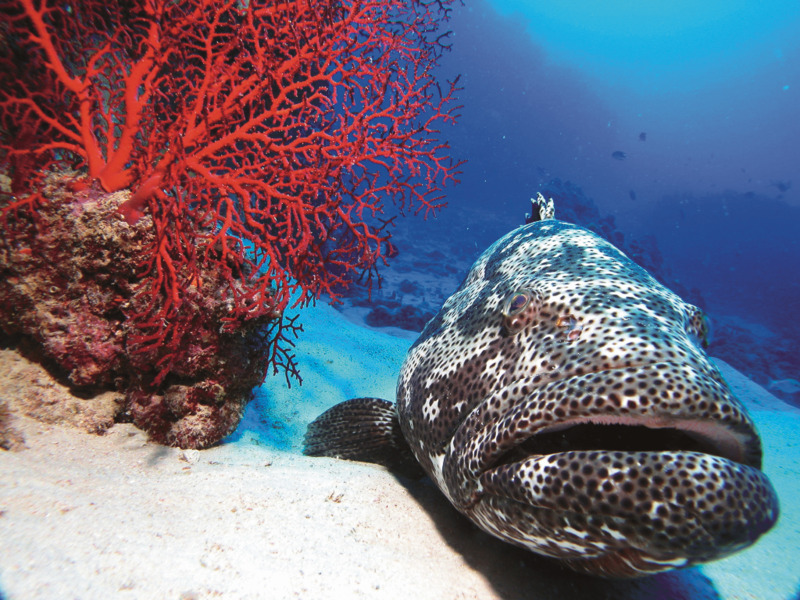 This is one of the most talked about destinations where you can scuba dive with a family of giant potato cod that swim with you and happily interact with you for hours on end. 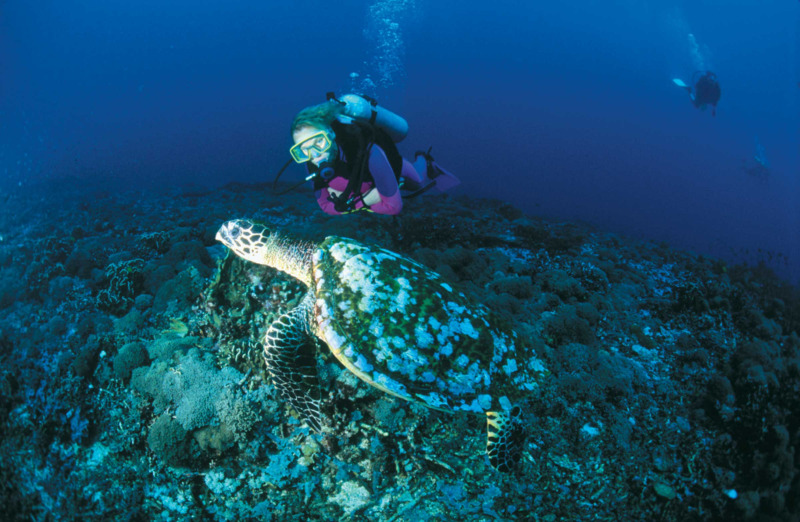 Scuba dive amongst these rich coral gardens where you will see a huge array of marine creatures such as turtles, Maori Wrasse, Stingrays, Pygmy Seahorses harmless reef sharks and much more. 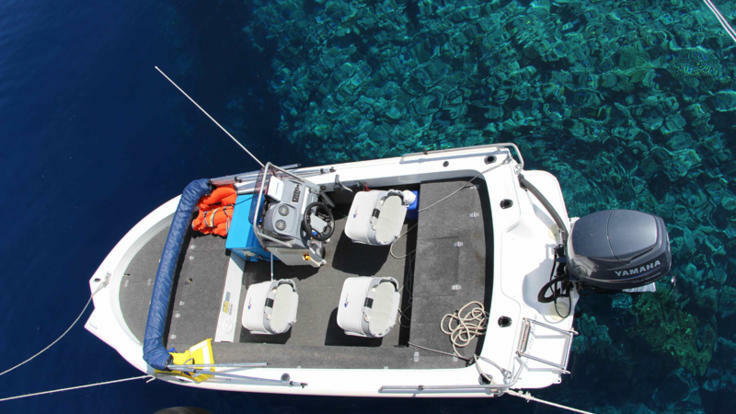 Topside, cruise out into the deep blue and try your luck catching giant trevally, wahoo, mahi-mahi and other game fish on the very edge of Australia’s continental shelf where they feed. End your perfect day with drinks and canapés whilst sharing your personal experiences. 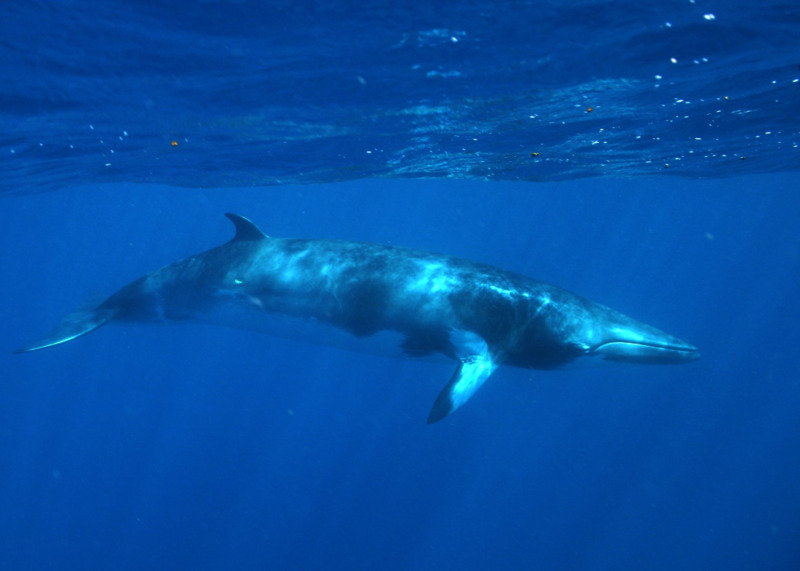 Your crew will advise you to keep your eyes occasionally fixed on the oceans waters to see the hundreds of spinner dolphins as they make their way out the reef passage to feed nightly on sunset. 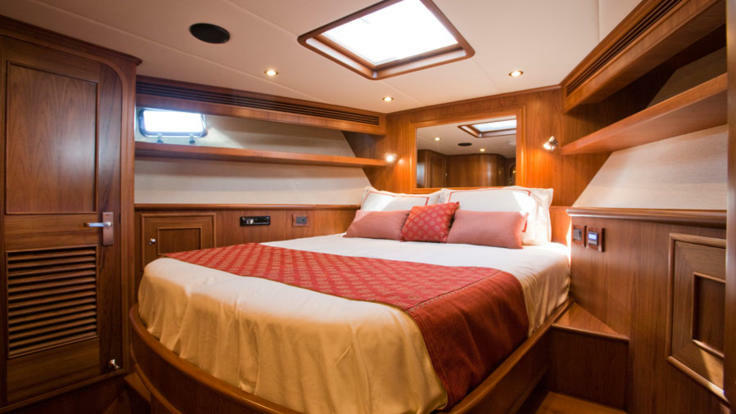 After dinner, get a good night’s sleep as your skipper transports you to the remote atoll, Osprey Reef, out in the middle of the Coral Sea. 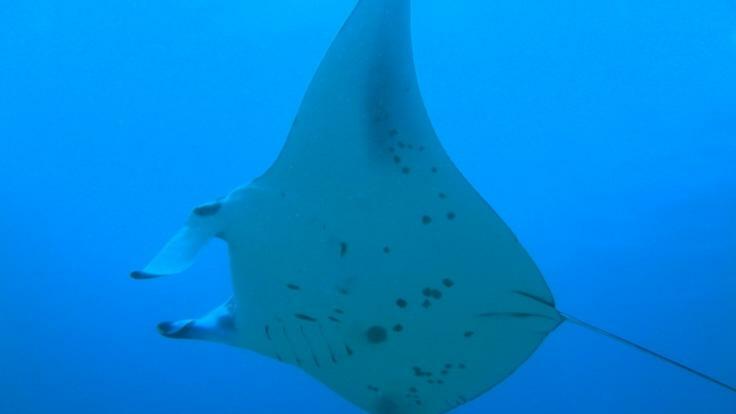 Be prepared for the next three action-packed days at some of the best scuba diving sites and most talked about coral reef scuba diving sites in the world. 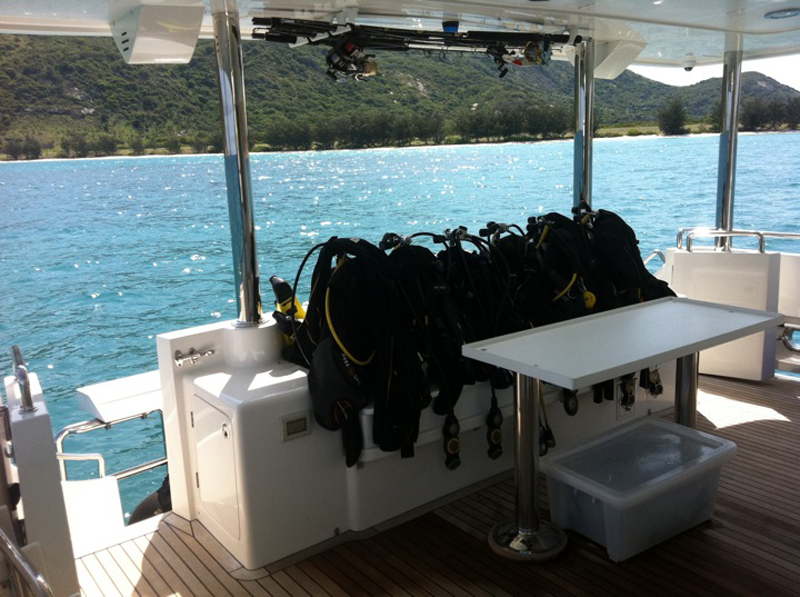 With 1000m vertical reef walls and visibility typically at 50m or more, you will be pleasured by the clearness of your underwater visibility. 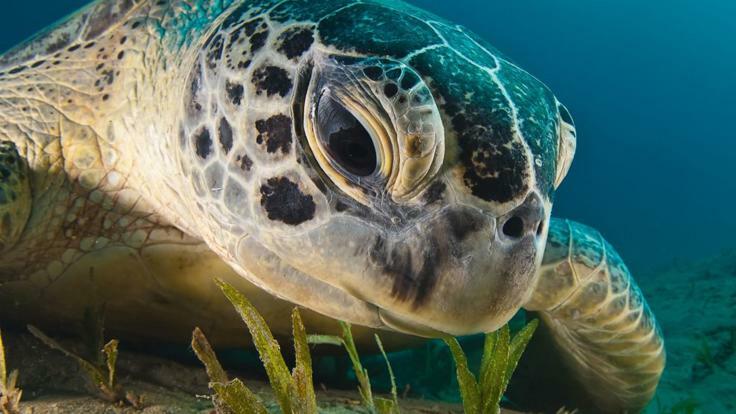 Just slowly drift past soft coral gardens, take in the massive schooling pelagic fish, and swim with the grey reef, silvertip and white tip reef sharks as they cruise on by minding their own business. 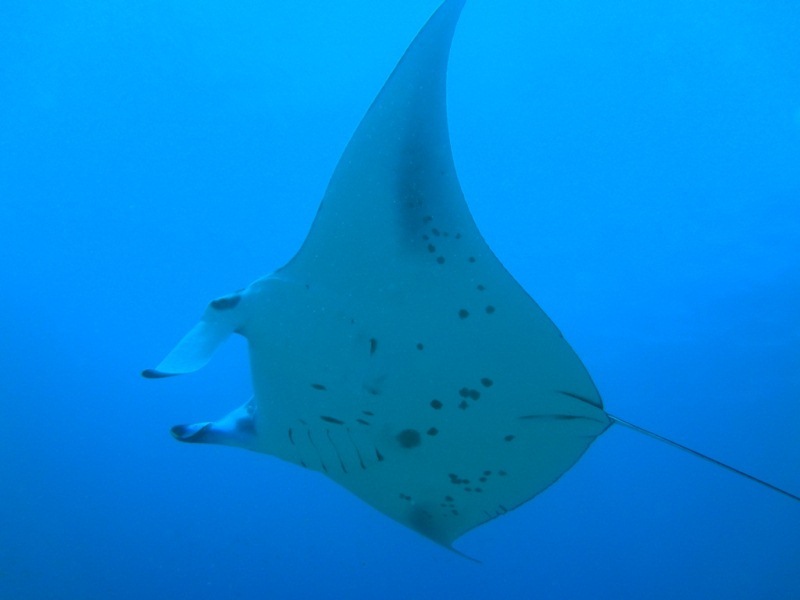 This area is well known for spotting the majestic and graceful manta rays and hammerhead sharks that come in to get a free clean and service from the suckerfish at the reef's cleaning stations. 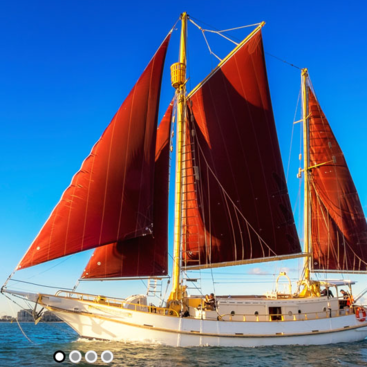 Try your luck at catching some fresh fish for the onboard chef to prepare for your evening meal after an exciting day exploring the depths Australia’s Great Barrier Reef. 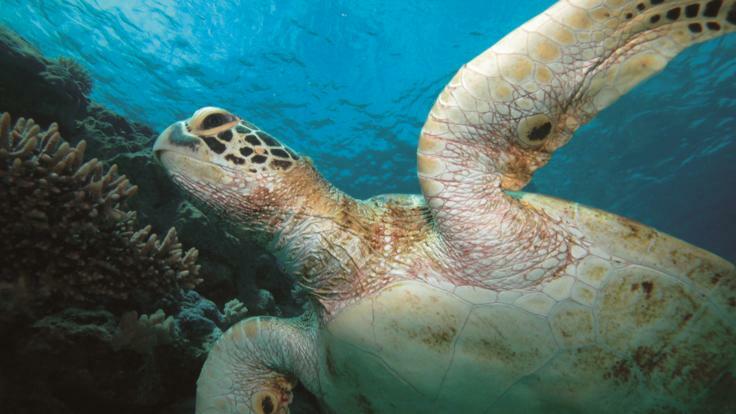 It’s your last day on the Great Barrier Reef so enjoy your snorkel, dive and fish before a leisurely cruise with an ETA to Lizard Island around midday. Here the chef will prepare your final gourmet meal before you board the flight back to Cairns after one of the most memorable weeks of your life! 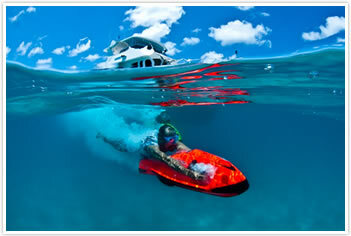 Snorkelling equipment, sea kayaks, water sports equipment, beach towels, fishing gear, all meals, soft drinks and juices. Alcoholic beverages can be pre-ordered at your cost. See more Great Barrier Reef private yacht charter options. 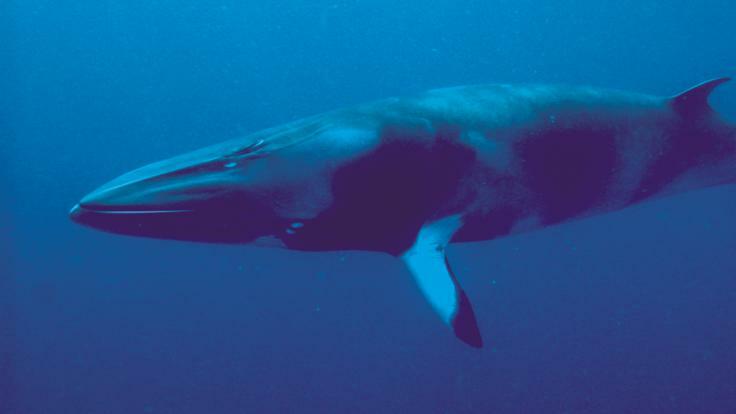 Minke Whale Expeditions: Get up close and personal and swim with Dwarf Minke Whales (seasonal) Swim with Dwarf Minke Whale permit required and can be arranged an additional fee so advance notification is required. 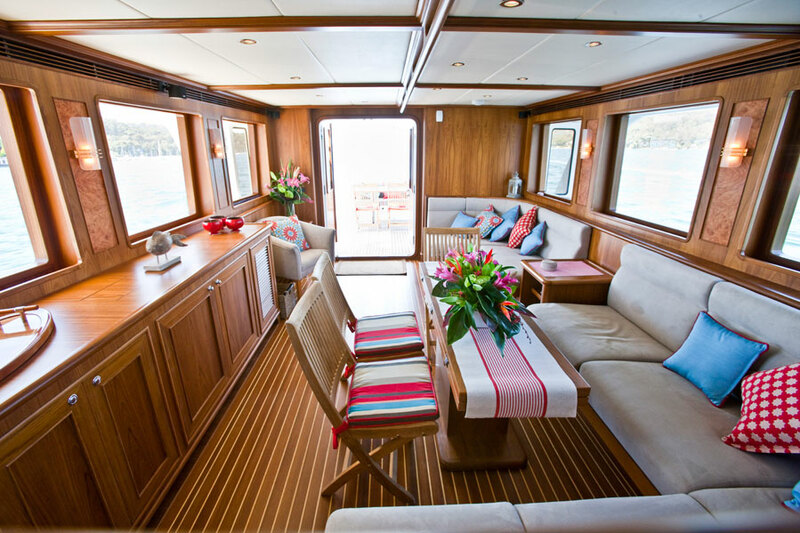 On Board Masseuse: Pamper yourself and enjoy a massage by your very own private massage therapist. 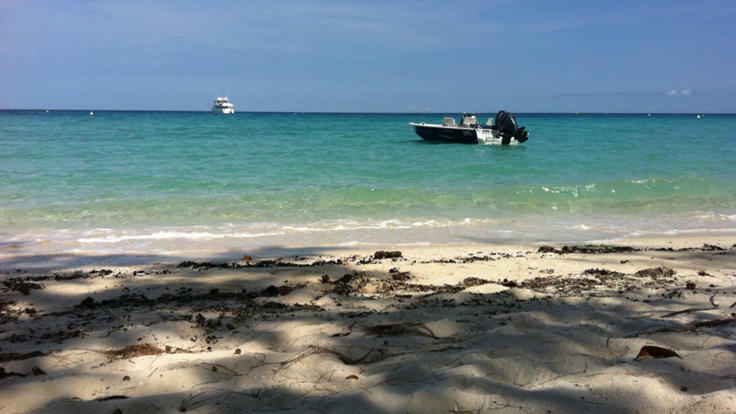 Private Car Transfers: Limousine and private car transfers can be arranged for pick-up and return to your Cairns, Northern Beaches or Port Douglas accommodation. Cancellations made from 119 to 60 days prior to commencement of the charter will forfeit all of the deposit, unless a replacement booking can be made, in which case 80% of the deposit will be refunded. Cancellations made prior to 120 days from commencement of the charter will have 50% of the deposit refunded. Cancellations made 59 to 30 days prior to commencement of the charter will have 50% of the total fees paid refunded, unless a replacement booking can be made, in which case 90% of fees will be refunded. Cancellations made less than 30 days prior to commencement of the charter will forfeit the total fees paid, unless a replacement booking can be made, in which case 80% of fees will be refunded. Cancellation due to inclement or unsafe weather will be made at the Captain’s discretion and every attempt will be made to reschedule the charter to suit the client. 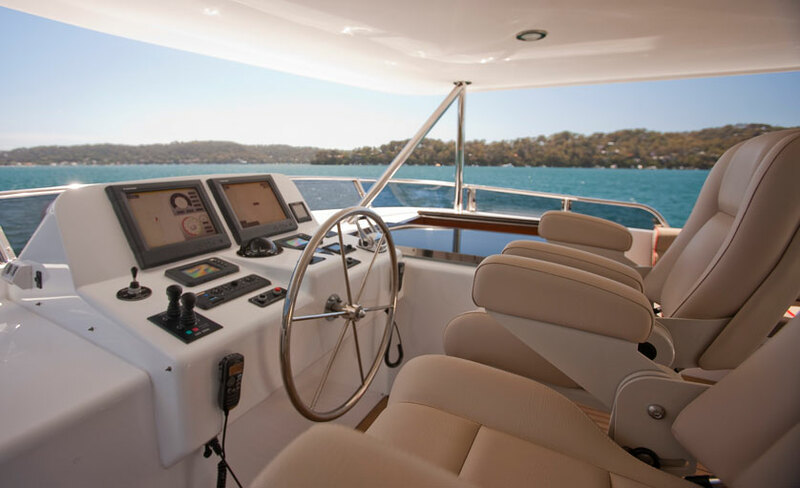 If Aroona Luxury Boat Charters is unable to reschedule the charter at a time that is convenient for the client 50% of the total fees will be refunded.